The 5-in-1 Secateur is a versatile tool ideal for all levels of gardener.The main functions include - root remover, mini saw, secateurs, weeding tool and pruning knife. As well as the five main applications the tool comes equipped with a bi-material grip and Stainless Steel blades to help prevent rust. With the use of the blade lock, the secateurs can be folded safely into a compact size fitting the pocket pouch included. 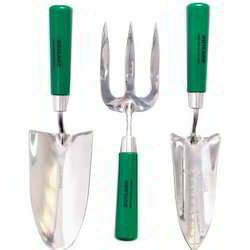 Rutland™ garden tools are proud to introduce their premier stainless steel range of gardening tools. The highly polished and ground stainless steel blades will not get so clogged up with soil and will cut cleanly through even the heaviest types of soil. Professional quality telescopic ratchet action 2 pulley pole pruner with 30 cm saw. Ratchet action for easier cutting of larger branches. 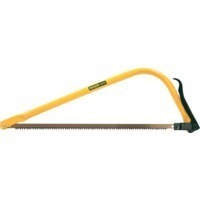 30cm saw for stubbborn branches. 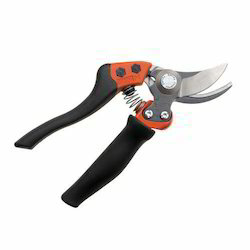 20% more efficient than non-ratchet pruners which provides excellent cutting capabilities. Carbon steel hardened blades. Will cut up to 26mm diameter branch. Length opened 2. 6 metres plus the length of yourself. Telescopic tubular handle, which can be locked off at any point. Friction free, non gumming & rust resistant teflon-s finish. Instructions for use: 1 check that there are no overhead power lines in the area you intend to work. Extend the pole to the correct length to reach the branch you intend to cut. Place the branch to be cut in the jaws of the pole pruner and pull the cord. 2. When you feel increased resistance of the cutting action on the branch release the cord slightly and you will hear the ratchet mechanism click to the next notch. 3. Repeat step 2 again when the resistance has increased. If you cannot cut the branch, using the jaws use the saw attachment instead. 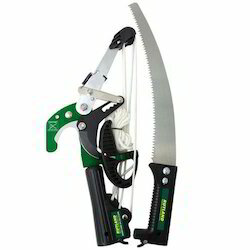 Do not attempt to cut branches which will not fit completely into the jaws, always use the saw on larger branches. Please oil all moving parts frequently it will last a lot longer. 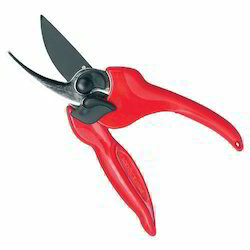 We are offering our clients 5960-BS Razorsharp Bypass Large Secateurs. With Telfon® coating, easy reach thumb catch, textured ergonomic handles for improved comfort and control, wrist/storage strap slot and trouble free coil spring. Extra large safety thumb catch for ensuring the blades are closed when not in use. Hardened carbon steel blade for positive cutting action, PTFE coated for improved corrosion resistance and smooth cutting. Bypass secateurs with a non-clogging telescopic spring and single-handed locking mechanism. Rutland hose pipes, nozzles, sprinklers and adaptors are a completely inter changeable range that allows you to fit and connect any of them together in the combination that best suits your needs! 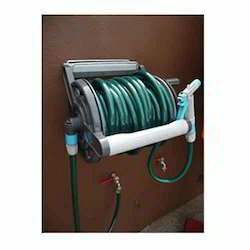 This wall mounting bracket provides a tidy solution to the storage of garden hose and fittings. Hose and fittings not supplied. 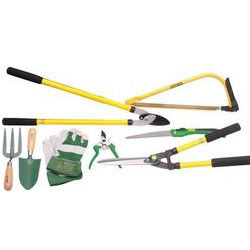 We are engaged in offering a wide range of Pruning Garden Set to our clients. We provide 2 way male snap action connector. 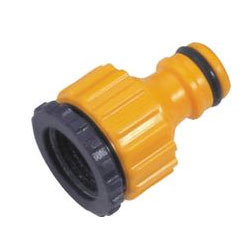 Rutland hose pipes, nozzles, sprinklers and adaptors are a completely inter changeable range that allows you to fit and connect any of them together in the combination that best suits your needs. 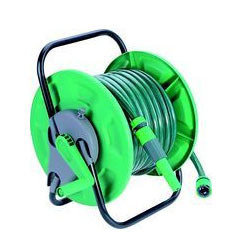 Simply push n click them together There Is everything from impulse lawn sprinklers to hanging basket spray lances, universal tap connectors, hose connectors, hose tidies, hose reel sets to spray guns! 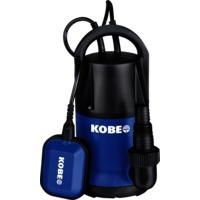 Ideal for watering the garden or cleaning the car. We are offering our client 1/2" & 3/4" threaded tap connector. Rutland hose pipes, nozzles, sprinklers and adaptors are a completely inter changeable range that allows you to fit and connect any of them together in the combination that best suits your needs! Simply push & click them together! 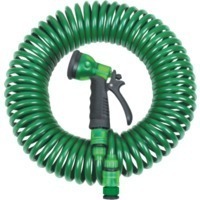 There's everything from impulse lawn sprinklers to hanging basket spray lances, universal tap connectors, hose connectors, hose tidies, hose reel sets to spray guns! 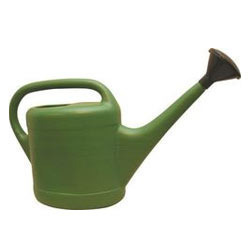 Ideal for watering the garden or cleaning the car. Rutland™ hose pipes, nozzles and sprinklers and adaptors are a completely inter changeable range that allows you to fit and connect any of them together in the combination that best suits your needs! 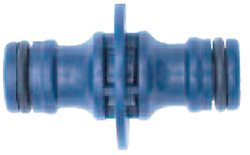 This fitting is for connecting two hoses with both having female fittings on the end. Secure water containers manufactured from food grade plastic available in 10, 15 and 20ltr capacities, fitted with a collared screw top for ease of refilling and a twist on-off tap for spill free dispensing. The moulded handle design makes it ideal for transporting and storing water in and around the work place, home or when traveling. 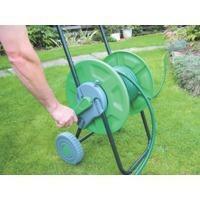 This large capacity trolley stores up to 60m of 13mm (1/2”) hose or 45m of 16mm (5/8”) hose. It is easy to assemble – snap and click, needs no tools. It has a sturdy frame with a rust and corrosion-resistant coating. Hose not included. WPS 750 Suitable for the effective draining of cellars, cisterns and the general transfer of water. Capable of continuous and reliable running, strong double insulated case with no metal parts are in contact with the water. 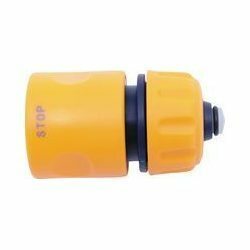 Overload protection and easy to remove filters for cleaning and access to the impeller. 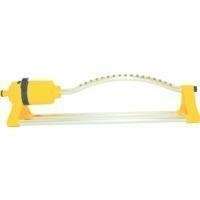 Fitted with an automatic float switch and a multi hose adaptor (25, 32, 38mm), can handle solids up to 5mm diameter. Motor: 750W. Maximum delivery height: 8.5m. Power cable: 10m. Flow Rate: 230ltr. This oscillating sprinkler has a gear drive operation for even, gentle lawn watering. 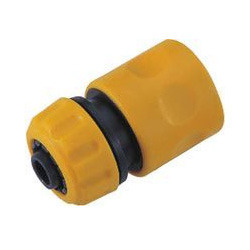 Coverage levers enable easy adjustment to your required oscillation width, giving a coverage of about 200m3 (depends on water pressure, length and bore of hose). These hose coil sets come complete with a seven pattern spray gun, heavy duty snap action connectors and a threaded tap connector. It is light in weight, does not kink or tangle and provides superior waterflow control. Spray patterns: • Soaker. • Mist. • Shower. • Jet. • Flat. • Centre. • Cone. All models feature lever tension handles for rapid blade change and rigid oval section frames. 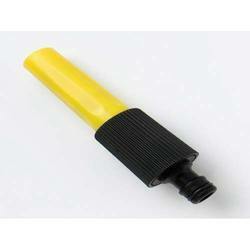 Supplied with clip-on plastic blade protectors to prevent injuries during transportation and storage. Suitable for cutting dry and green wood. 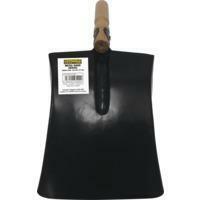 Suitable for gardeners, landscapers, builders, farmers etc. Standard duty suitable for occasional use e.g. DIY, gardener etc. Heavy-duty suitable for regular use e.g. professional landscapers etc. Triangular Pattern - Low profile frame for use in confined areas, for example among tree branches. Loggers Pattern - Full frame suitable for heavier sawing of logs, tree trunks etc. Bypass secateurs with a non-clogging telescopic spring and single handed locking mechanism. Standard Duty Contoured rubber grip handles. Maximum cutting diameter: 25mm. Overall length: 200mm. Heavy Duty Textured rubber grip handles. Overall length: 215mm. Contents: Hand trowel, weeding fork and bulb planter, digging spade and fork. 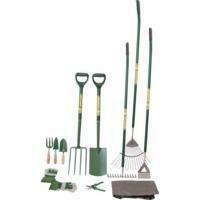 Garden rake, dutch hoe and lawn rake all with carbon steel heads, aluminium handles and soft rubber grips. 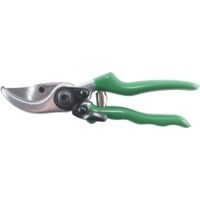 Bypass secateurs - maximum cutting diameter 25mm. Heavy duty polythene garden bag with 170ltr capacity. Heavy duty Canadian rigger gloves size 10. 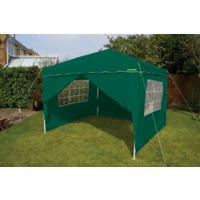 Set of four sides for use with RTL-984-2500K gazebo shelter. Made of 140g polyester with hook and loop fixing straps for easy attachment. Large PVC arched windows on two sides to maximise natural light and zipped doors on other two sides for easy access.